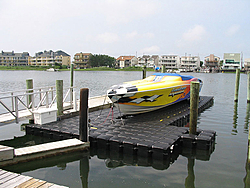 Cost for a boat lift? how much would a lift for up to a 46 cat cost? also on a wooden dock... was wondering about one of the lifts that are just sacks... fill em with air to lift the boat and leak the air to lower it? I'm just wondering how much does a boat lift cost? I have a 25' Baja and need a lift of at least 7,000lbs. What are the additional cost for a canopy top? Opinions on Shorestation vs Shoremaster? How much more would a 10,000lbs lift cost? Just incase I want a bigger boat. My bad I did indeed check it out as well. Contact mike nanda at IMM/quality boat lift. He is a friend and mentor. I typically go to him with one-off ideas and hard to accomplish needs. To date, I have more than a dozen "unique needs" for lifts in excess of 27k lbs and down. In fact, there are at least two members on oso that have heeded this same advice and had stellar results.....below what they expected to pay.....especially with the "custom" need attached. Mike/IMM Quality is not national, they are global. You can search through my previous threads to see the results from other members "referrals.."
Don't talk to a sales puke. Talk directly to the owner. You will be pleased. I have a Jet Dock system that i used for my 27 Powerquest. I sold the boat, moving to a sea ray and looking to sell the dock. it is in the OSO classifieds. 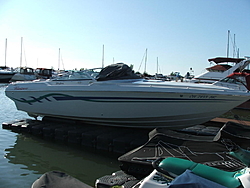 But anyways, with the drive on dock, much easier to maintain and you can walk around the whole boat. No needing to raise or lower the dock very easy to use. My buddy has his 48 Fountain Express on one and Jet Dock sells to Coast Guard. First pic is a 46 OL on a Jet Dock and the other was my 27 Powerquest. Last edited by pkspx; 10-27-2013 at 07:36 PM. We are going to put together a complete thread on the Mirage as soon as we can get all the pics together......as far as the Bertram she's went to the middle east and never heard from again.....I check on boatmad once in awhile but I never see anything about it......it's like car keys dropped into a river of lava....forget it man there gone! Bummer about the Bert. Look forward to the Mirage thread! Rich ( CommanderSander) turned me on to mike and I can't say enough about him or the product. Search in the general section here and you will find a thread I did sometime around June 2013 talking about how pleased I was with IMM. PM me and I'm glad to speak to you about my experience.